First, I want to tell you that Tom is feeling much better! Toward the end of last week, he really started to sleep better and act more like his usual, happy self. And he was feeling well enough to visit the “Pig Train!” again on Friday with friends, so I was happy. I really hated seeing him feel so badly. 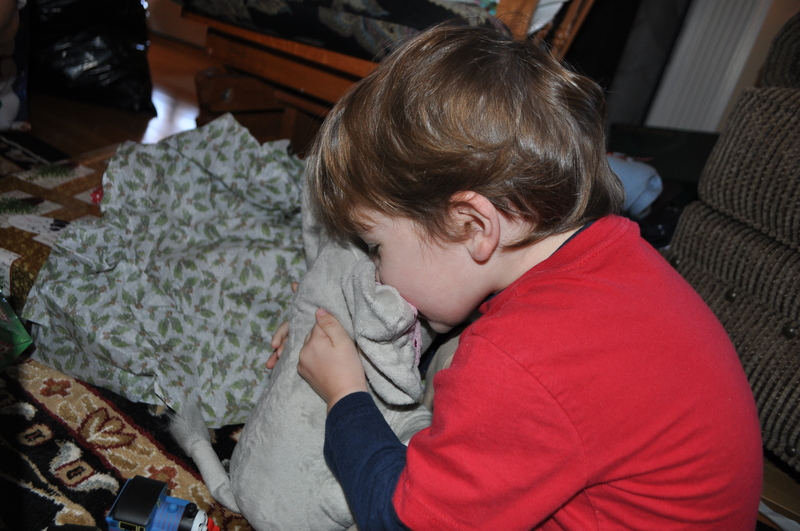 And I really hated trying to find ways to get him to take his meds. So yeah, riding the Pink Pig again was nice. For both of us. Since Tom was feeling better, that meant our plans were still on for him to spend his first night at his Mimi and Pops’ house. He spent Saturday night with them so I could make Kev take me to the Fox Theatre to see the Nutcracker. Tom had a great time! He got a glowing report from Mimi and Pops so I was thrilled. Is it just me who worries how their child will do over at a grandparents house? I mean, I knew he’d behave and have fun, but I was worried he’d give them problems sleeping. But he didn’t! Yay! Tom is so rad. To celebrate his good behavior (not really) we all headed over to Mimi and Pops’ house to celebrate Christmas with them yesterday. Kev’s parents visit their moms over actual Christmas, so celebrating with Kev’s family is always our First Christmas. And it’s awesome. 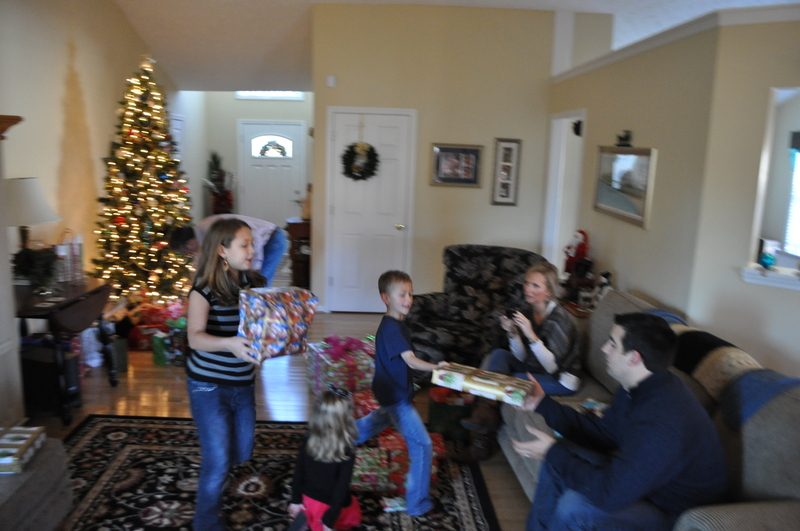 My nieces and nephew are the elves who hand out our gifts. And they are experts at it! 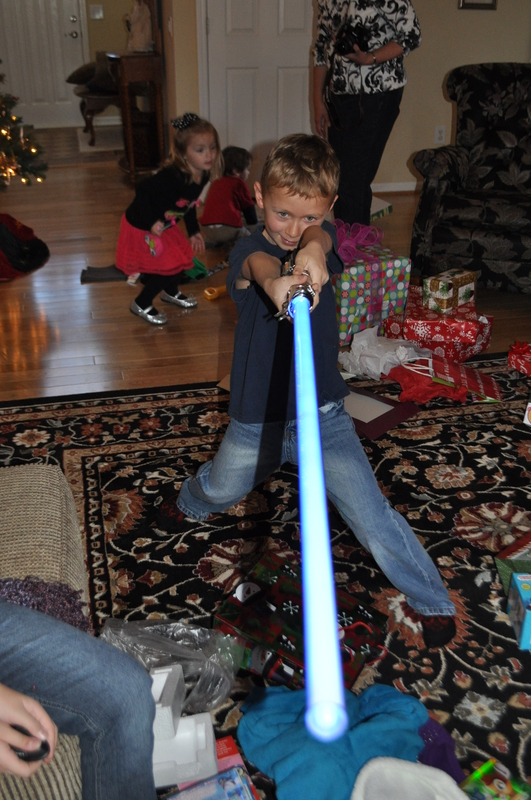 Kev picked out our nephew’s gift — a “real” lightsaber. To say he loved it would be an understatement. Although he did express some regret that it wouldn’t actually cut anyone’s hand off. 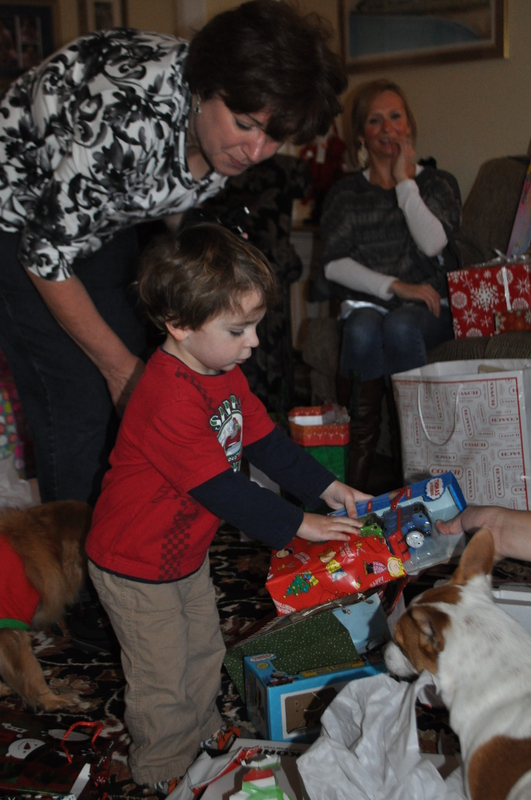 Mimi showing Tom his new trains! 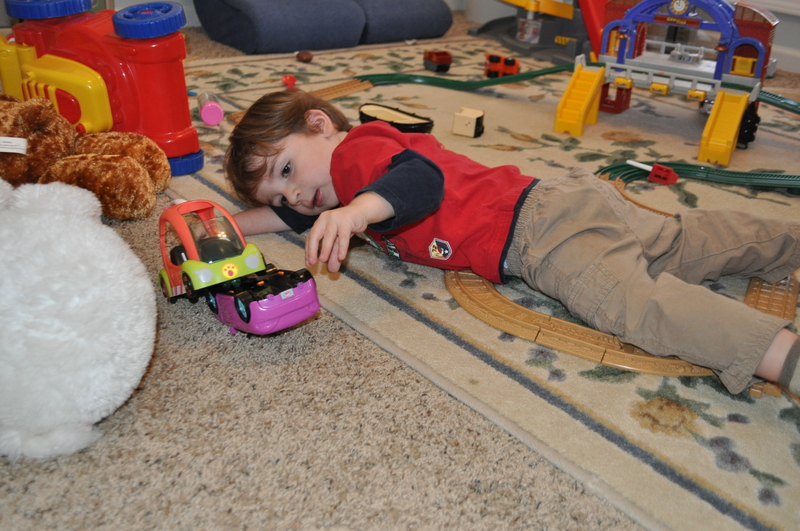 Playing with his cousin’s new gift! 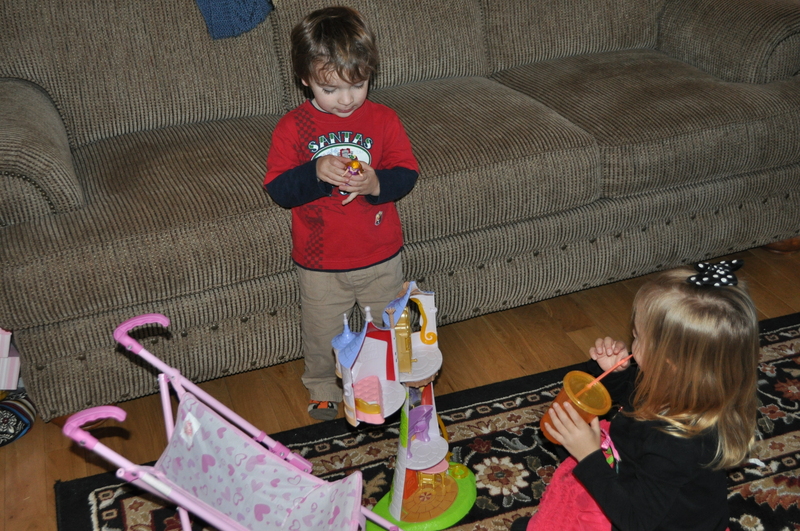 Which he correctly identified as “castle.” Genius! What is Tom loving so much he’s kissing it? 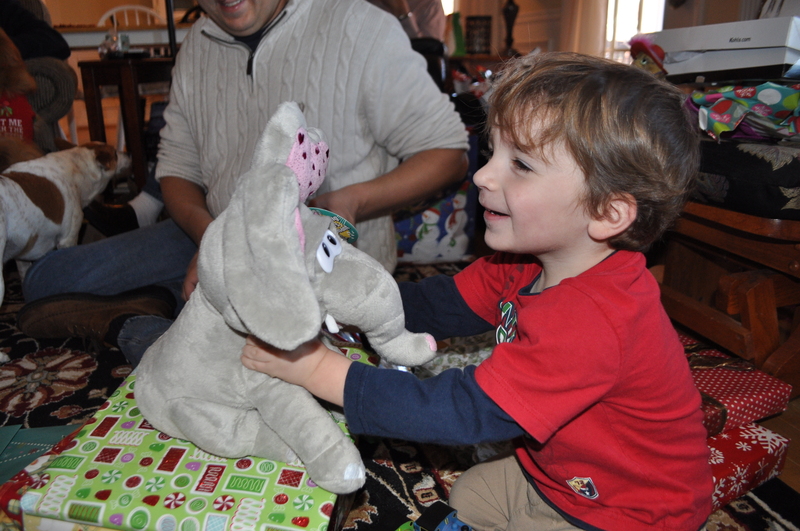 If you guessed “an elephant that plays music and has dancing ears,” you’re correct! 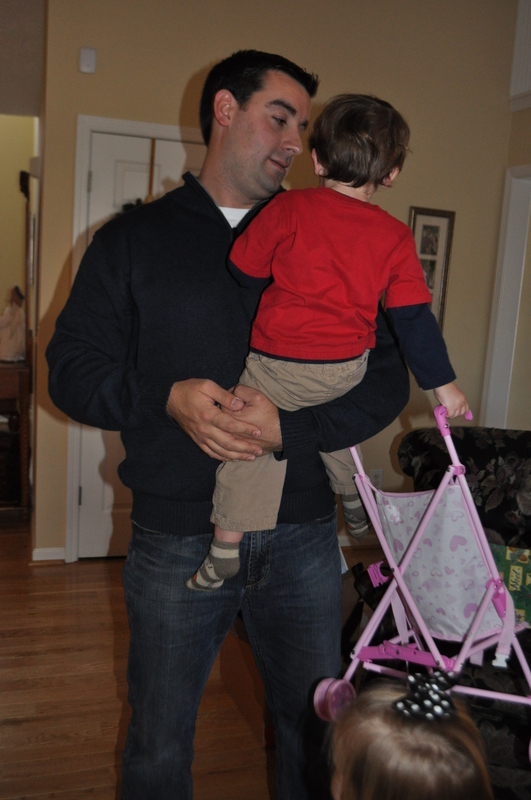 Tom likes to give Uncle Kyle hugs while holding a baby doll stroller. As do we all. 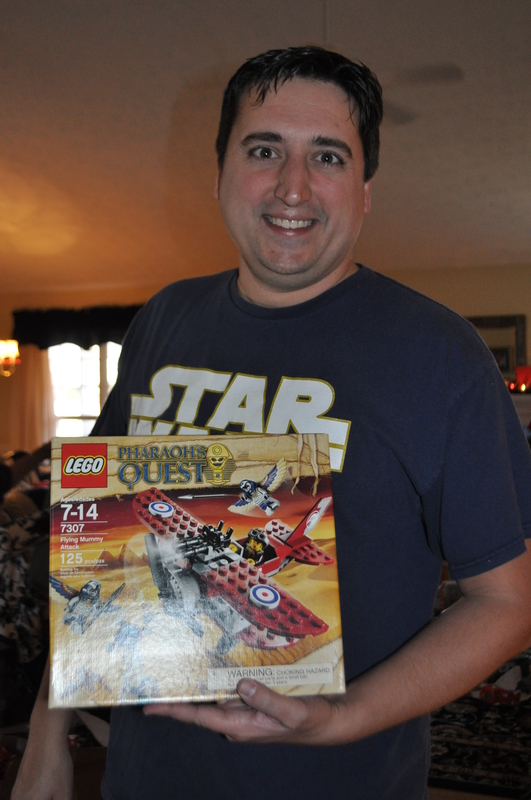 Kev said this was “the perfect gift.” It’s Legos! A plane! Egypt! All things he likes. Combined = Perfection, according to my hub. Tom was very tired, and happy, at the end of his busy weekend! Total. Cuteness. We had a wonderful time and Kev, Tom and I (and Huck too!) are thrilled with how thoughtful and amazing everyone was. And yes, brunch was yummy and delicious too. 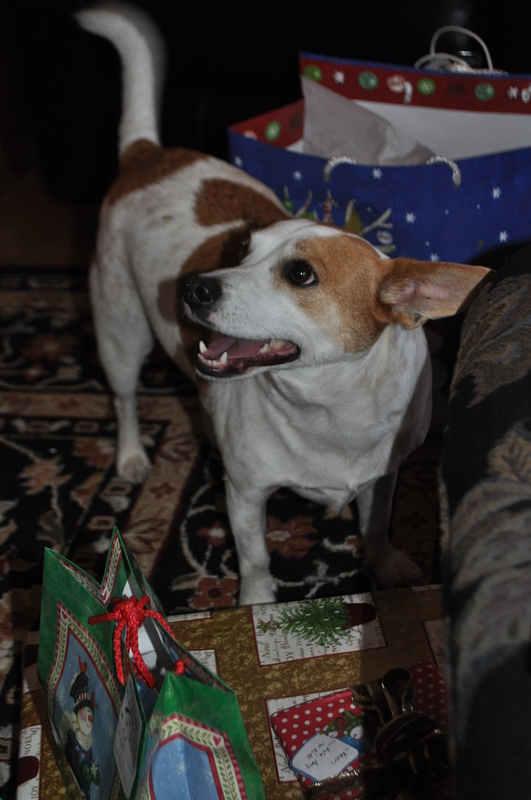 Hope y’all have a wonderful (First) Christmas too! This entry was posted in Bits, Family, Huck, Kevin, Motherhood, Tom. Bookmark the permalink. 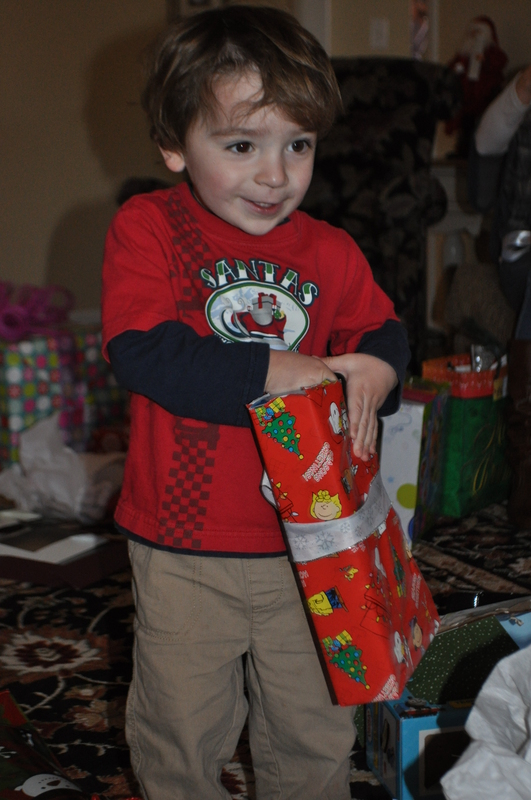 1 Response to Bits: First Christmas Edition. Uncle Kyle and Kev sure look a lot alike!! And I love that “the perfect gift” suggests ages 7-14. 🙂 Looks like fun times. Boy, that Tom is cute!